Where to even begin… I read If I Stay, a young adult novel by the incredibly talented Gayle Forman, around three years ago while I was still in middle school. Immediately after finishing it, I read the sequel, Where She Went, because it had just released and I needed more. More Mia, more Adam, more Mia and Adam, and most of all, closure on everything following the ending of the first novel (I’ll try to keep this post spoiler-free). I absolutely love this duology. I love the realness, the rawness that Forman manages to evoke in the flow of her story and in her characters in a seemingly effortless manner. When I found out (a bit belatedly) that If I Stay was being turned into a movie and would release this year, I was beyond excited. But I was also nervous- I worried that the storyline would be over-romanticized and changed to make teenage girls who don’t read swoon. And when I first looked up the cast, I was ambivalent about Chloë Grace Moretz playing Mia, because she just isn’t the way I pictured the protagonist in my head. Jamie Blackley looked much more the part of Adam immediately to me. However, as more and more previews played (and I couldn’t avoid them any longer, as much as I wanted to retain my mental image of Adam and Mia), I grew used to the idea of Chloë-as-Mia and made my peace with this minor issue. It also helped to discover that Gayle Forman was an executive producer of the film, and she helped write the script. Well, I saw the movie last night with my fellow blogger friend, Grace. We both read the book for the first time years ago (and have obviously reread it multiple times since it’s so great). I can only speak for myself, but I thought the film was a hit. I loved it, all of it, and I am normally very critical of book to movie adaptations. The movie stayed true to the book it’s based on, but was easy to follow for those who have not read the novel (shame on them!). I thought the acting and character representations were spot on, and the wardrobe, sets, and film locations were perfect. It was such a pleasure seeing the characters come to life. The Hall family was is so cool, Mia is so wonderfully awkward at times, and Adam should be a role model for all boyfriends. The movie also gave me all the feelings that the book gave me. I laughed because it was funny, I shed tears because it was devastating, and I got chills because it was heart-wrenching. There were so many “aw” moments because Mia and Adam’s relationship was so lovely, and realistic to the extent that true love and soul mates exist. They are perfect for each other, they love each other so much, and they have common interests, yet they still have to battle through rough patches and rocky decisions. Their love story is perfectly imperfect (as further proved in Where She Went). For me though, the movie was not just about the romance. Yes, that is a huge aspect of the book, and therefore the film. But I think that love in general is what ties everything together- love of music, love of family, love of friends, and love of life. 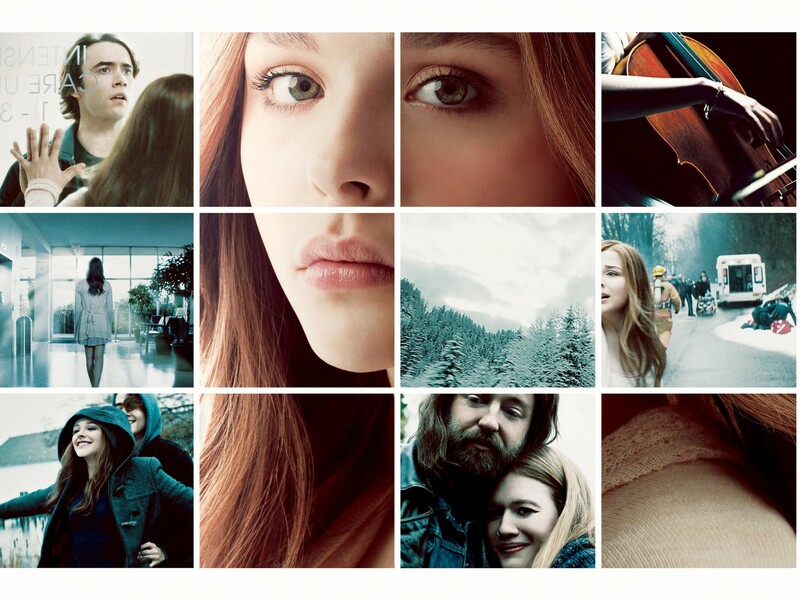 If I Stay– both the novel and the movie- champions life. There is so much to live for, and love is what makes a good life. I would not change this movie. I do wish that Mia’s relationship with and deep love for Teddy was shown more. But with the switches back and forth between the present (comatose Mia in the hospital) and the past (Mia’s budding career as a concert cellist and Mia’s relationship with Adam, including bits and pieces of her family and friends), it might have been overwhelming to explore another relationship in-depth. There were parts of the movie when I would begin to tear up, and then a happy flashback would occur and I wouldn’t have time to cry. Sometimes the switches back and forth were a little quick or choppy, but I thought the timing was pretty good overall. The movie also omits Mia’s struggle to make Kim and Adam friends, but I didn’t feel it needed to be included. And on a side note, Adam’s band was renamed from Shooting Star to Willamette Stone (some of their songs are on the movie soundtrack). Minor, minor changes, guys. If I Stay is a fantastic novel and a fantastic film. I highly recommend seeing it, even if you’ve read the book. Especially if you’ve read the book. I don’t think you will be disappointed. Lovers of the book will love it, and hopefully those who have not yet read the novel will after seeing the movie. The movie stays very true to the book, doing it the justice it deserves. It has received positive reviews by critics (an A- from Entertainment Weekly and a 7.1/10 rating from IMDB) and is number one in the box-office since it’s release Friday. I rarely see movies and I’m always wary of page to screen adaptions, but in my book (no pun intended), If I Stay was a huge success. Well done. I believe in love at first sight. Many a bag has caught my eye from up close or a distance, and I am gone, fallen in love with one look. With bags and me, there seems to be an instant click. That being said, I never “clicked” with the Alexander Wang Rocco bag. When it started getting hype a few years back, I just didn’t understand it. The bag looked slouchy, the leather dull and faded, and the studs too edgy for me to ever imagine carrying. Well, all that changed on Saturday while I was watching the lovely Zoella on YouTube. 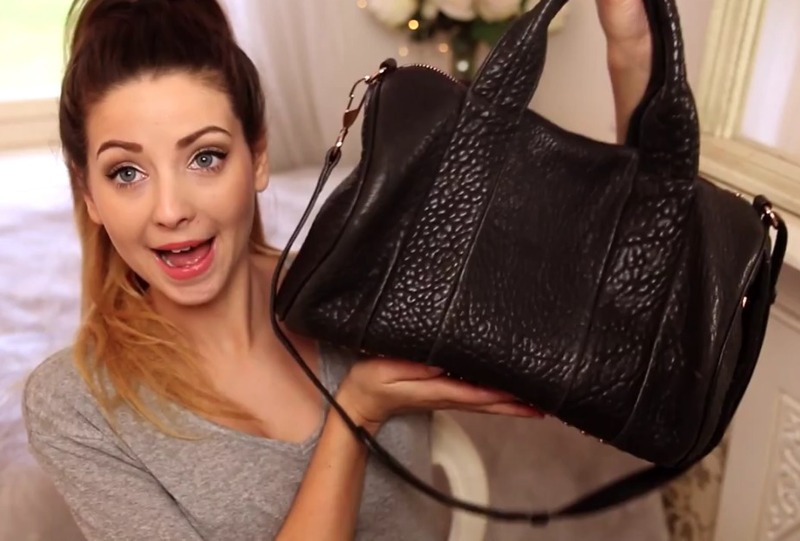 I watched her “What’s in My Bag?” video from January, and in it, she lifted up her black Rocco bag with rose gold hardware. And I was gone. I fell in love in less than ten seconds. So naturally, my new obsession led me to do bag research into the wee hours of the morning, and half of the following day. I found different color combinations, types of leather, reviews, and prices. I imagined all the outfits I would wear the bag with, what I would put in it, where I would take it. I had to actually shut my laptop on several occasions to prevent myself from ordering it then and there. This bag is slightly under $1k. For a designer bag, that’s on the lower end of the price range. But it did raise to mind some concerns. For one, the bag is made in China. Another is that the studs could get scratched when the bag is set down. I don’t know if I should get the rose gold hardware because I don’t even own any rose gold jewelry. There have also been some reviews that say the quality of the leather and stitching is hit or miss. So do I take a leap of faith and order one, seeing for myself if these issues come to light? Or do I wait it out until a sale comes along or my obsession dies down? There are other bags I want, certainly. But none so affordable as this. And the laid-back nature of the Rocco draws me in, more fitting to my relaxed style now than a few years ago. Thus, I find myself torn over what to do. To buy, or not to buy, that is the question.